"I'm really satisfied with my achievements this year and hope to do even better in 2015..."
P.S. You have been in the TOP-10 of the World Ranking in the two main disciplines, Freestyle and Speed Slalom, for the last four years. This year you improved a lot. How do you feel about your achievements in 2014 in both disciplines? Zoé. 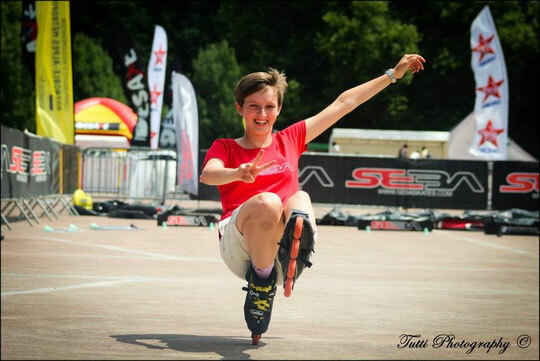 I'm really satisfied with my achievements this year in speed and freestyle slalom. I worked very hard and it was worth all the efforts I put into it, so I'm proud of myself. I did really great results and great performances. I'm also really satisfied with keeping my rankings in both TOP-10s, and hope to do even better in 2015. P.S. Do you think it's possible to keep your WR#2 in Speed Slalom, even rank #1 in 2015? Zoé. I think it will be hard to keep my 2nd place because there are a lot of great skaters who want to be on top of the ranking and do good results. We will all fight for it at competitions and see what happens. P.S. Who will be your main opponents in both disciplines in 2015? Zoé. In freestyle my main opponents will be Dasha Kuznetsova, Klaudia Hartmanis, Marina Boyko, Su Fei Qian and Feng Hui. In speed slalom everyone has a great level, so I don't have any special opponent. P.S. Is it hard to compete with your own sister? What do you feel when you find yourselves into the same battle group, for example? P.S. 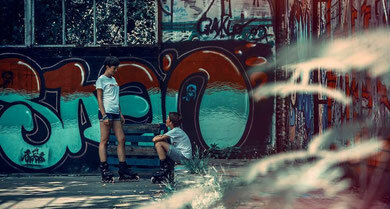 What about doing a Pair Slalom run together one day? Zoé. Yes we've already tried to create a pair slalom run but it's a lot of work and we don't have a lot of trainings so we'd rather concentrate on our own classic runs, on battle and speed. But if we find the time maybe one day we will! P.S. A competition moment you are particularly proud of in 2014? Zoé. My 3rd place in speed slalom at the world championship because I was so surprised to get it! The overall level was really high, all the best skaters were there and I didn't expect to do such a good result. I was fighting to go through to the next rounds, but getting a place on the podium was unbelievable. P.S. Any regrets this year? Zoé. Yes… I really regret my classic performance at the European Championships… Unfortunately, I missed all my tricks and I couldn't expect better than the 9th place. I'll work and do better in 2015 for sure! P.S. Your best 2014 event 2014? Zoé. The best 2014 event for me was the Shanghai Slalom Open. It was my first Chinese event and I was very excited to go there! I really enjoyed the city, the competition and the after party! 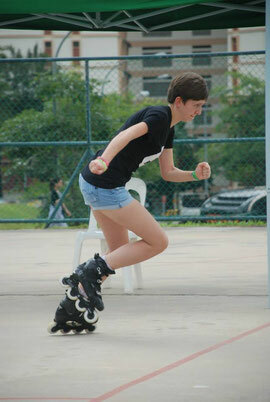 I had a really great time there with all the skaters! I hope to come back there really soon! P.S. The best 2014 skater 2014 in speed/freestyle according to you? Zoé. The best skater in speed slalom for me is Savio Brivio because he owns the new world record, and in freestyle it is Dasha Kuznetsova for her two World Champion titles in battle and classic. Congrats for their performances! Zoé. My goals for 2015 are to do my best in every discipline, enjoy each competition, have fun, and do good results. Zoé. I would like to thank Seba (especially Igor) and my parents for all the travels, the Seba Team and the French Team for the great times together and support, all the skaters and friends who supported me and of course, my sister Lily.